When I'm in Amsterdam I always go to the store 'Weekday'. It's such a cool store we don't have here in Belgium. They have an amazing sale, which is definitely worth the name 'sale'. 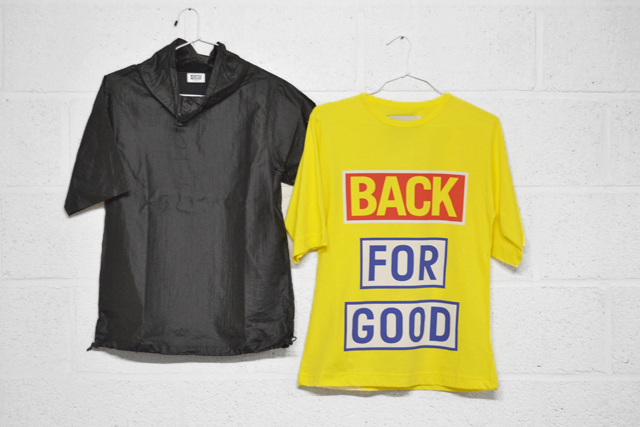 I came home with those pieces: A bright yellow t-shirt from the brand 'BACK' with the slogan 'back for good'. I guess you already recognize those tees from other bloggers, it was kind of a small hype. I like this one for the yellow color (It's my favorite color) but also for the slogan so yea why not. I mean, with 70% sale you can't ignore this one ;). I also bought a black top, a special one. I don't know the fabric but it's a bit shiny and feels like a rainy fabric. It's very thin so definitely perfect for the summer and there're strings at the top and bottom. Dat gele shirt is gaaf! Ik ken die winkel niet! (schaam, schaam)! Suuuper gaaf dat gele shirt! Ooohh noo :D vind hem echt leuk, is wel een apart stijltje met merken zoals Cheap Monday enz !